I make a few litres of yoghurt every month or so. I started making it regularly during one of our no-spend challenges. I didn't have any culture or a thermometer or a yoghurt thermos. I spotted Siobhan's delightfully simple yoghurt making method and loved that I didn't need to buy a thing. All you need is the dregs of yoghurt from the bottom of your last tub and milk. Each step is simple and uncomplicated. For example, you heat the milk 'until it starts to froth at the edges but hasn’t quite boiled' and then cool it 'until you can place the palm of your hand against the side of the pot'. I used this method for around a year. I had plenty of failures but also learnt a lot about how to improve my yoghurt making. I then bought a thermometer and have since perfected my yoghurt making so that each and every time I get a super thick delicious yoghurt. I was planning to share my yoghurt making method. But then I spotted Typically Red's homemade yoghurt tutorial. She uses a method almost identical to mine and her pictures even look like the ones I'd taken to include in the post. So instead of repeating the steps here I'll send you over to her yoghurt making instructions. The variations I make are related to making the yoghurt thicker. #1. Add a few drops of Calcium Chloride to the milk prior to heating. #2. Maintain the milk at 90 degrees celsius for at least 10 minutes. I've read that this allows some of the moisture to evaporate and also that it changes the structure of the milk proteins. I'm not sure which is true but have noticed that the longer I leave the milk at 90 degrees the thicker it is. #3. Incubate the yoghurt at 40 degrees celsius for 8 - 12 hours. 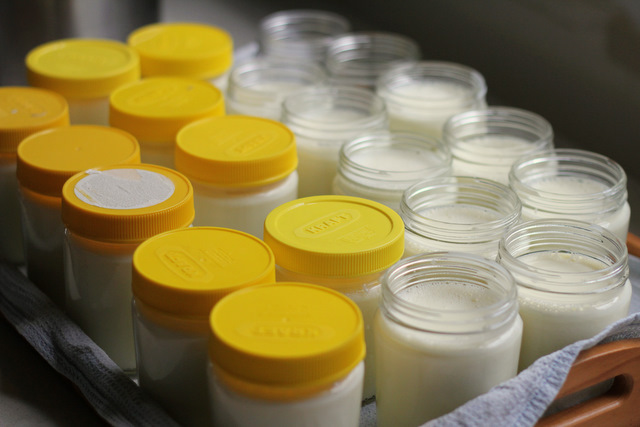 Longer incubation time results in a thicker yoghurt, but the trade-off is that if you leave it too long it becomes sour. Do you have any yoghurt making tips?